Such a good day! « You know… that Blog? I’m having a great day, despite being exhausted from not sleeping well last night. Yesterday the Hubby and I spent the day together and did some cross-border shopping in New York (state, not City). Didn’t buy much, but it was very nice to wander around and spend the time together. When we got home, I found a lovely package in the mail from my Kiwi Soul Sister, Broot! What a sweetheart my friend is :) I had mentioned to her how much I loved her little origami dragons that she makes, and she said she’d send me one! He arrived today with a lovely card, a couple packages of NZ themed stickers, and a fabulous story about the legend of Mauao. New Zealand history and folk lore is really fascinating! Broot (of course I named him Broot!) immediately hopped up on my laptop keyboard, and because I use a usb keyboard instead, he has made it his permanent home. I think he looks rather good there, and he will be a wonderful daily reminder of my lovely friend so far away in NZ. Thanks Broot!! Also, today is, of course, J-B’s big day – I’ve left him a note on our Brain Fart website, here… – please drop by and wish him a happy birthday, won’t you? He’s not a blogger as much as I’ve prodded him to share his wonderful stories, and he participates in our Haiku only to make me happy, (so he won’t be coming to visit, in other words) but he’s one of my best friends and I love him dearly! Have a great day, everyone! See you tomorrow for a Freestyle Sensational Haiku Wednesday! Don´t you just love blogging friends? Just today I got a package from my dear friend Jeanie too. She read in my blog a while ago that we do not have a good selection of funny birthday cards over here, so she sent me about 10 of them. Isn´t that great?! What a cool dragon you got. 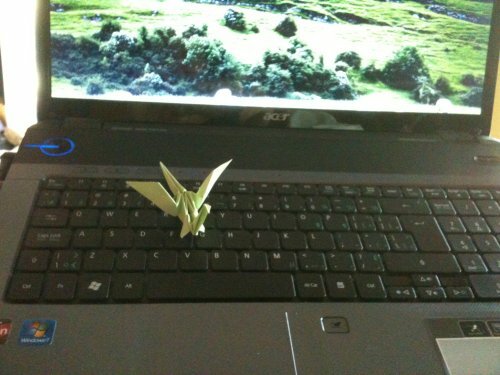 I love that she made it herself. Me too! And what a great idea to send you a bunch of cards! So nice! What is up with all the “not sleeping” happening these days? I barely got any shuteye, couldn’t sleep a wink either! It’s not helping with my MOOD. Which is grumpy, by the way. Next time you go into New York State (not the city) get some of that Metromint water. You will love it. Metromint water? I’ll have a boo for it next time I’m down! It’s great to ditch everything and just go and wander somewhere else for the day. 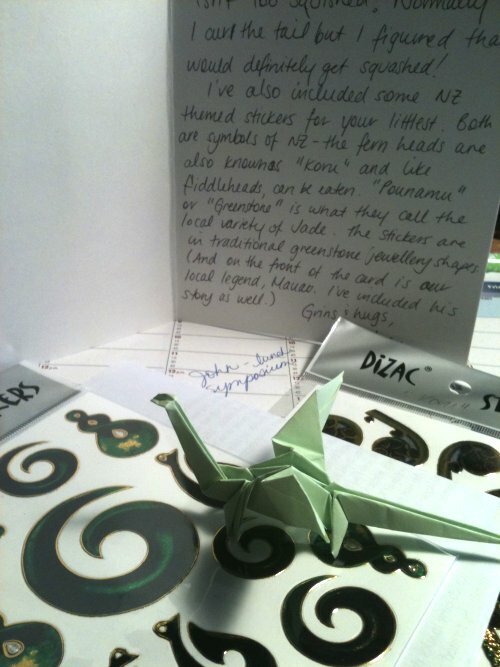 So sweet that Broot sent you a dragon too – love it, she has such lovely hand writing too.